In 2007, for the first time in human history, a majority of the world’s population lived in cities. However, on a global scale, poverty overwhelmingly retains a rural face. This book assembles an unparalleled group of internationally-eminent scholars in the field of rural development and social change in order to explore historical and contemporary processes of agrarian change and transformation and their consequent impact upon the livelihoods, poverty and well-being of those who live in the countryside. The book provides a critical analysis of the extent to which rural development trajectories have in the past and are now promoting a change in rural production processes, the accumulation of rural resources, and shifts in rural politics, and the implications of such trajectories for peasant livelihoods and rural workers in an era of globalization. 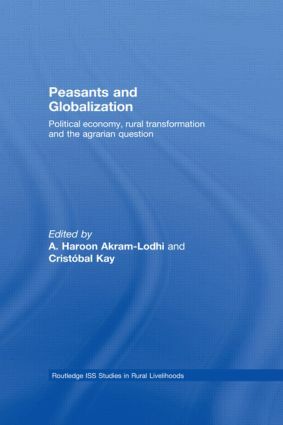 Peasants and Globalization thus explores continuity and change in the debate on the ‘agrarian question’, from its early formulation in the late 19th century to the continuing relevance it has in our times, including chapters from Terence Byres, Amiya Bagchi, Ellen Wood, Farshad Araghi, Henry Bernstein, Saturnino M Borras, Ray Kiely, Michael Watts and Philip McMichael. Collectively, the contributors argue that neoliberal social and economic policies have, in deepening the market imperative governing the contemporary world food system, not only failed to tackle to underlying causes of rural poverty but have indeed deepened the agrarian crisis currently confronting the livelihoods of peasant farmers and rural workers. This crisis does not go unchallenged, as rural social movements have emerged, for the first time, on a transnational scale. Confronting development policies that are unable to reduce, let alone eliminate, rural poverty, transnational rural social movements are attempting to construct a more just future for the world’s farmers and rural workers.